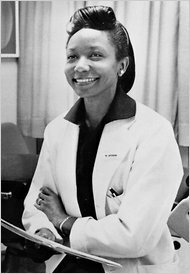 Dr. Mildred Jefferson, the first African-American woman to graduate from Harvard Medical School and the first female surgical intern at Boston City Hospital, broke many race and gender barriers during her long career as a doctor. But it was when she turned to politics, emerging four decades ago as a eloquent leader of the antiabortion movement, that she began to win a following. Dr. Jefferson died Friday at 84, according to Anne Fox, a close friend and the president of Massachusetts Citizens for Life. The exact cause of death is unclear, but Fox said Dr. Jefferson’s health had declined two weeks before her death. St. Martin first met Dr. Jefferson in the early 1970s, and she remembers when she realized the surgeon was also a powerful political presence. At a women’s conference in St. Cloud, Minn., St. Martin was standing in an auditorium with hundreds of women. All of a sudden, she heard a crescendo of clapping and cheering. She looked across the cavernous room to see Dr. Jefferson stepping onto the floor. Dr. Jefferson, a board member and former three-term president of the National Right to Life Committee, remained active in the movement until just a few weeks ago. She had called St. Martin earlier this year to discuss the group’s oratory contest for young people. And on Oct. 7, she filmed her weekly interview show on the Boston Neighborhood Network, said Fox, who appeared with her. Dr. Jefferson was small in stature — Fox believes she often wore hats so she would not disappear into a crowd — but she did not shrink from controversy. And she was not afraid to use blunt analogies to state her views. In a 2003 profile in the antiabortion magazine American Feminist, Dr. Jefferson said the antiabortion movement was “second only to the abolitionist movement’’ in the way it changed American thinking. “I am at once a physician, a citizen, and a woman, and I am not willing to stand aside and allow this concept of expendable human lives to turn this great land of ours into just another exclusive reservation where only the perfect, the privileged, and the planned have the right to live,’’ she told the magazine. Dr. Jefferson, who had been living in Cambridge, was born in east Texas, the only child of a Methodist minister and a school teacher. She spent days riding around on the horse-drawn buggy of the local doctor as he made house calls, Fox said, and after Jefferson graduated from Texas College, she enrolled in Harvard Medical School. She graduated in 1951 and took an unusual step for a woman: applying for a surgical internship at Boston City Hospital. She later became the first female doctor at the former Boston University Medical Center. A profile of Dr. Jefferson in the 2004 book “African American Lives’’ suggested that she became politically active in 1970, after the American Medical Association passed a resolution stating that members could ethically perform abortions if the procedure was legal in their states. Dr. Jefferson, who believed that the Hippocratic oath required her to oppose the procedure, returned to Boston and began an unending fight against abortion, according to the book. She served as a prosecution witness against Dr. Kenneth Edelin, a Boston doctor charged with manslaughter for performing an abortion on a Roxbury teenager. Several times, Dr. Jefferson ran unsuccessfully for political office, including as a Republican candidate for the US Senate in 1982, 1984, and 1990. Dr. Jefferson broke many barriers yet didn’t have a driver’s license. “The story was that she was always thinking about so many interesting things that she wouldn’t be paying attention to the road,’’ Fox said. A former skier, she stayed nimble into her 80s, wearing ankle weights when she walked around her Inman Square neighborhood. She dressed carefully — although she needed glasses, she did not like to wear them in public — and sported red, white, and blue to political conventions. She often met friends at the S&S Restaurant near her home, and became such good friends with the owners — Democrats — that when a family member died, she attended the funeral, said Richard Wheeler, a nephew of the owner. A memorial service for Dr. Jefferson will be announced. An only child, Dr. Jefferson was divorced and had no children; her closest relatives, Fox said, are the grandchildren of her cousins.